Berliner Philharmonic conducted by Herbert von Karajan, Christian Ferras, violin. Released originally in 1981. 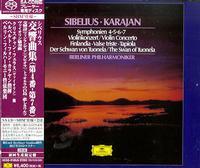 Sibelius Symphonies 4-7, Violin Concerto, Finlandia, Valse Triste, Tapiola, Swan of Tuonela.